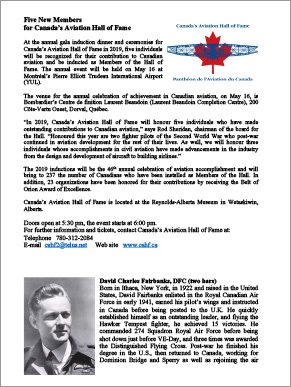 Canada’s Aviation Hall of Fame (CAHF) will hold its 46th annual gala dinner and induction ceremonies on Thursday, May 16, 2019, at the Laurent Beaudoin Completion Centre, in Dorval, Quebec. The annual event is a highlight in Canadian aviation celebration and draws attendance from across Canada. In 2019, new Members to be inducted are David Charles Fairbanks, DFC, John Peter Holding, P.Eng., Barry Paul Lapointe, O.B.C., James McGregor “Greg” McDougall, and William Philip “Bill” Paris, C.M. If you would like to attend the event, or would like to sponsor a table, you can purchase tickets or a table below. More Information.